Corned beef roast, corned beef and cabbage, corned beef sandwiches, corned beef hash. All these classic dishes start with a tough cut of beef called a brisket. Here are four very easy cooking methods to transform that gnarly slab of meat into fork-tender meals, along with recipes, videos, and prep tips. Why does corned beef come in a plastic bag? Corned beef is a beef brisket that's been soaked in a seasoned brine of water, curing salt, and spices. The soaking or curing process typically takes several days. When you buy a package of corned beef at the store, the beef is already soaking in the brine and is ready to cook. Some recipes tell you to rinse off the brine before cooking, some don't. A spice packet sometimes accompanies the meat, to be added to your recipe as you choose. What cut of beef is the brisket? Brisket comes from the heavily exercised front limbs of the animal, and is consequently a tough and chewy cut of meat. However, when cooked low and slow with moist heat, the connective tissue in this muscle-bound cut breaks down, turning this tough customer all juicy and succulent. What does corn have to do with corned beef? Not much, actually. The name comes from the large, corn kernel-sized grains of salt the meat was packed in to preserve it before modern refrigeration was invented. This video for Corned Beef and Cabbage shows you what to look for when you're buying corned beef, plus how to cook and slice it. Place the brined corned beef in a large pot or Dutch oven along with the liquid and spices that accompanied it in the package. Pour in enough water to cover the beef, then bring the water to a boil on the stovetop. Reduce the heat to a simmer, and cover the pot. A three-pound corned beef could take three hours or more to become perfectly tender. Check the meat occasionally, adding more water if necessary. The beef is ready when it pulls apart easily. For a one-pot feast, you can add shredded cabbage and chunks of potatoes and carrots to the pot during the last half hour of cooking. Watch the video for Corned Beef and Cabbage I to learn more. Use a large roasting pan or Dutch oven, with or without a rack, depending on the recipe you use. It could take about one hour or more per pound to cook, depending on the thickness of the roast. Since corned beef needs to cook with moist heat, you'll cover the pan or wrap the roast with aluminum foil to prevent it from drying out. Be sure to check the liquid as it cooks, replenishing it if needed. You can add vegetables during the last hour of cooking. This video for Braised Corned Beef Brisket shows you how it's done. Popping everything into the slow cooker is the easiest, most convenient way to cook corned beef. If you're cooking carrots and potatoes with the meat, consider adding them about halfway through. A four-pound roast will take four to five hours on HIGH, or eight to nine hours on LOW. Cabbage doesn't take much time to cook, and can be added in the last hour. For more, watch the video for Slow Cooker Corned Beef and Cabbage. Fork-tender brisket in a fraction of the time. That's the beauty of using your pressure cooker or Instant Pot multi-cooker to make corned beef. If you'd like to prepare your own corned beef from a fresh brisket, allow about a week for the brisket to soak in the brine. 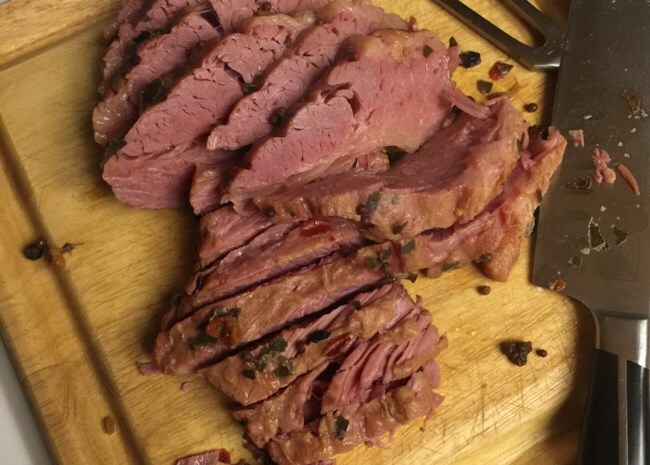 Do the Irish really eat corned beef for St. Patrick's Day? Sorry to bust that myth, but corned beef and cabbage on St. Patrick's Day is more of an American tradition than an Irish one. Here's what they really eat in Ireland on St. Paddy's Day (definitely NOT St. Patty's Day, BTW). More: Explore our entire collection of corned beef recipes. Yes, you can make your own pastrami using corned beef. Allow yourself about two days from start to finish. But think of the bragging rights! Find more Irish recipes in our St. Patrick's Day collection. Good food, friends, and fun are always on the menu. Find me as foodelicious on Allrecipes and vanny.gee on Instagram (but only if you don't mind cat pics and cocktails).